It was decided that it would be good to show and discuss some of these in one of the UK&I TechHuddles with the theme of connecting the workplace. The idea that came to mind was employee on-boarding. UPDATE: The videos from the Reading session is now available and the sessions have been written up in the Cisco blog. Hope you haven't forgotten anything! Realistically today we all expect to launch our web browser, click a few times and then have what ever we wanted delivered! Outside of the business world this is defiantly the expectation with our on-demand, self-service oriented lives yet when we step back into work we don't quite have the same experience. I actually wrote a post about this a couple of months ago on the Cisco blog site (http://gblogs.cisco.com/uki/i-want-it-now/). As a result I wanted the example I created to have an easy consumption model requiring minimal input from the requester and then automating the rest. During the session I split the demo into three logical sections (presented as vidoes due to the complexity of setting up access points in remote locations to connect to the lab), I will detail in the following section how I achieve the example. The first part shows an end-user requesting both a permanent member of staff and contractor new user account. All that is required from an input perspective is the first and last name, a user type and the office location. Based on the input information an automated process will be kicked off using templates depending on the type of employee selected. Now that the user accounts have been created I show the two new employees connecting to the same corporate SSID using the new credentials. It shows the full time employee can browse the whole Intranet including R&D pages however the contractor does not have the access rights to access the R&D section (being redirected to a forbidden page). Joining a new organisation and/or office is always daunting, especially if you don't know anyone else. Would it be nice that as part of the process you are introduced into the office social spark room? It will also post a picture (taken from the 'security badge' system). This will help existing members of staff recognise you and know your name so they can introduce them selves and you are also able to get involved with any social events or discussions. Now that you have seen the 3 examples you are probably wondering what is actually happening here? 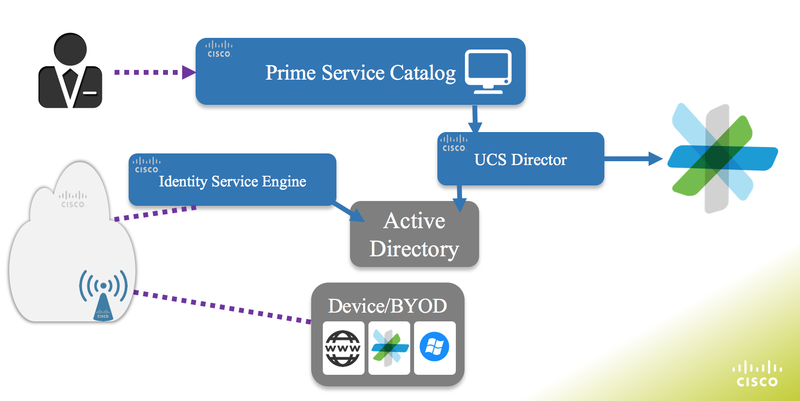 A catalog item has been published into Prime Service Catalog using the out of the box integration with UCS Director using its Rest API. 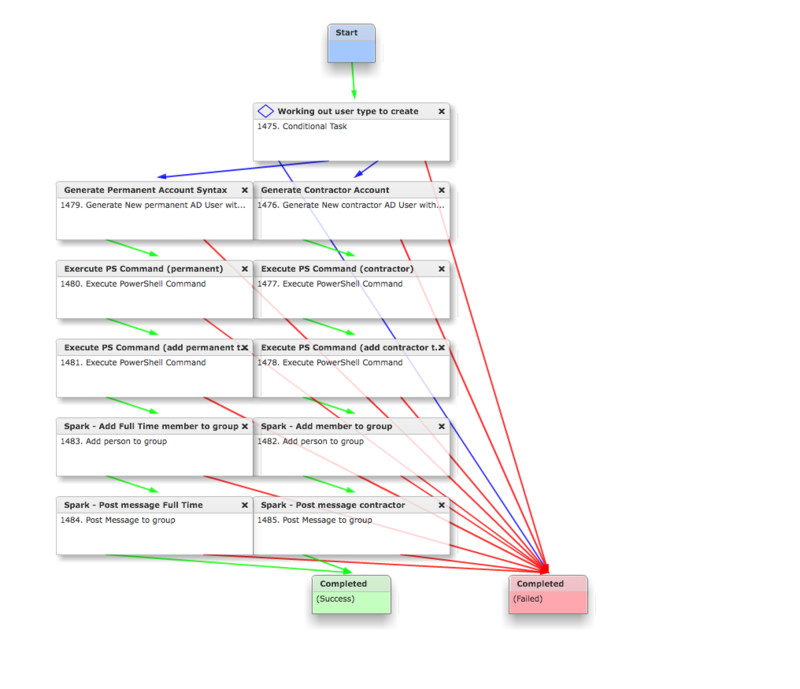 Based on the input either the full-time employee or contractor path will be followed (I accept that this could be created in a more efficient way, this was created as a proof of concept and evolved over time), this uses a conditional task (1475). UPDATE: I have updated the scripts, of the latest please go to with my Github account or the Communities page link. //                      powershell commands and Spark messages. //                      be used by other tasks in the workflow. //output.PowerShell_ADUser = "New-ADUser -Name \"" +input.FirstName + " " + input.LastName+ "\" -Enabled 1 -GivenName \"" + input.FirstName + "\" -Surname \"" + input.LastName + "\" -SamAccountName \"" + shortname +"\" -UserPrincipalName \"" + shortname + "\@miggins.com\""
output.PowerShell_ADPassword = "Set-ADAccountPassword -Identity " + shortname + " -Reset -NewPassword (ConvertTo-SecureString -AsPlainText \"C15co123\" -Force)"
Once the various outputs are created we configure active directory. Once the accounts have been created in active directory the users are added to Cisco Spark Room via its Rest API. This is the are customisation was done and involved creating a number of CloupiaScripts to interact with Spark. These have been shared and documented on the Cisco communities site (https://communities.cisco.com/docs/DOC-64423). As I have documented this elsewhere I wont go into detail here. The documentation provided for Sparks Rest API is very good and also some great introduction courses in DevNet (https://developer.cisco.com/site/spark/) to help you get up to speed (https://developer.ciscospark.com/). The area that I do not spend time with during my day job is the WLC or ISE. I worked with a colleague to configure these. A number of CVD exist for integrating these products (http://www.cisco.com/c/en/us/td/docs/solutions/Enterprise/Borderless_Networks/Unified_Access/byoddg.html). In the Demo the wireless Access Point (AP) is configured to use a virtual Wireless LAN Controller (WLC). The WLC is connected to ISE to allow use to authenticate the employees using their newly created AD accounts. When the users browse to the Intranet site ISE will either allow or redirect to a forbidden page depending on which AD group the user has been added to (permanent or contractor).